Remember when you had only two choices in contact lenses? “Hard” lenses (rigid gas permeable) were best for sharp, clear vision, but were often irritating and uncomfortable. Soft lenses were the most comfortable, but often provided less-than-optimal vision. Now, a technological breakthrough makes that choice a thing of the past. SynergEyes contact lenses deliver the crisp vision of a rigid lens plus the all-day comfort of a soft lens. SynergEyes combines two types of contact lens materials – a rigid gas permeable center and a soft hydrophilic outer skirt – into one unique “hybrid” lens. The rigid center provides high oxygen transmissibility for healthy eyes and clear, sharp vision, and the soft skirt surrounding the center gives you the all-day comfort of a soft lens. The HyperBond™ technology used in SynergEyes lenses delivers exceptional strength at the junction of the soft and rigid materials. The center is highly oxygen permeable which is critical to maintain corneal health. SynergEyes is free from “toric lens rotation”, a common problem associated with astigmatic lenses that causes inconsistent vision. 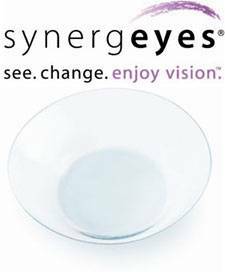 SynergEyes also can be fabricated into a bifocal design providing clear distant and near vision for patients with and without astigmatism. SynergEyes optics remain stable, delivering consistently clear vision – blink after blink. Thanks to the rigid center optics, you can enjoy crisp, clear vision as never before, while providing the comfort and wearability of a soft lens. SynergEyes also eliminates the problem of irritating debris that can collect under conventional rigid lenses and you won’t experience the annoyance of lenses moving when you blink or dislodging with your active lifestyle. Have you had a disappointing experience with contact lenses in the past? The SynergEyes hybrid design eliminates problems many people have with contact lenses. SynergEyes may very well be the contact lens breakthrough for your lifestyle. Call Vision Care Consultants for an appointment to try this revolutionary new contact lens for both rigid and soft contact lens patients.